Once Callnote stops recording your audio or video meeting it saves the recording locally on your computer. You can view and manage all recordings in the recordings library. You can sort recordings in your feed by date, timeframe, participants. You can add tags and notes to your clips to quickly remember and retrieve them for future use. Callnote video recorder has a handy set of inbuilt editing tools to polish the recorded audio or video. Once you’ve done with editing your recordings, you may want to export them to one of the integrated clouds, to post them in social media or to email them. 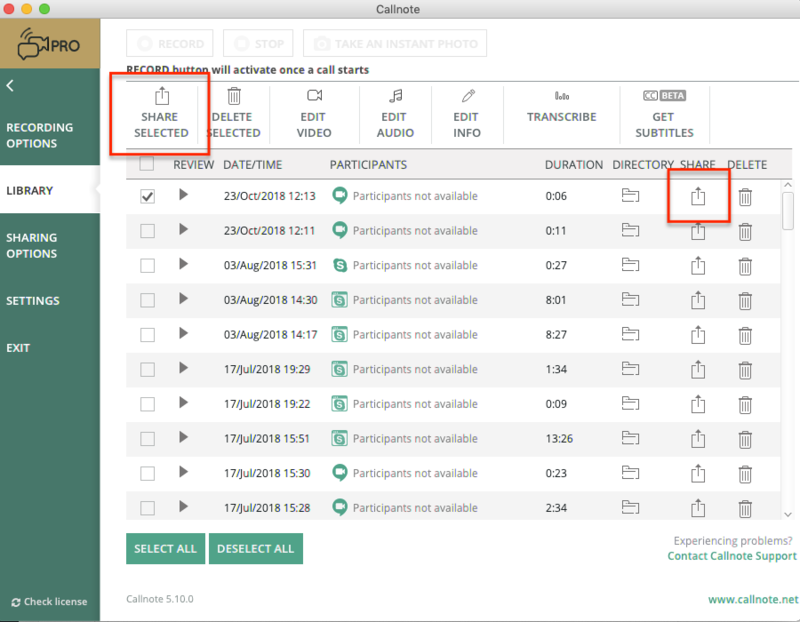 With Callnote you can instantly send your recorded content – video and audio files, chats and snaps, transcribed text and subtitles. Open the app, go to Sharing Options tab and select a destination. Callnote Regular users have the option to export the files to Dropbox. Callnote Premium users have a more extended list of destinations including Evernote, Facebook, YouTube, and Gmail. And Pro users have the full stack of options with OneDrive, GDrive sharing available. If you choose Dropbox, for example, click on the Dropbox icon. Click Connect and your Dropbox account login page will be opened in the browser. Please login and click OK when the Dropbox account page is opened in your browser. The principle is the same for Evernote, YouTube, Facebook, GDrive, OneDrive, and email sharing. 4. Once you set up forwarding, please go to the Library tab to select the recording and click on one of the Sharing buttons. Please note: Uploading files longer than 15 minutes might require updating your YouTube account. disconnecting and connecting the destination once again. So, there you have it. Questions? We’re here to help. Please feel free to reach out to our team at support@callnote.net.